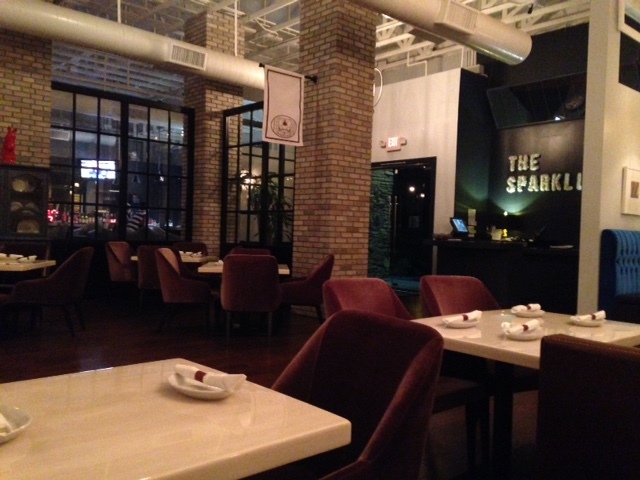 Atmosphere: We heard some good stuff about a local haunt, The Sparklings, so we decided to check them out for dinner. We got there at about 8:30pm so there was only a handful of people between the restaurant and bar area. First impression was that it was a very nice restaurant, maybe we were under dressed in our jeans. There were tables, couches, and it was all arranged in a very modern atmosphere. A giant chandelier and some flowers were in the center. I would have to imagine that this place isn’t too busy, or this would be a very poor use of space as it was not overcrowded with the tables. For an appetizer we ordered bacon wrapped meatballs. For the main dishes we had bowtie pasta in cream sauce, the club sandwich, and a chicken and rice with cream sauce. The presentation of the meatballs was kind of bland, just four meatballs in a dish with a lot of sauce on top. In fact you couldn’t even tell there were meatballs in there until you dug around. The taste was very good it was just a little small for an appetizer. I also didn’t think there was much flavor to the tomato sauce. There’s also supposed to be date with the bacon and the meatball but I have no idea where those were as I didn’t taste anything remotely close to a date or date like. My husband says he got one in his meatball, so I guess it was date night for him. The bowtie pasta in cream sauce was good from what my daughter said. It was a decent portion for the kids meal and for $6.50 including the drink it was a good deal. The club sandwich my husband got was just a club sandwich, a pickle and nothing else no fries or a side dish. The ham and the turkey looked fresh and the color was good the avocado looked fresh and the bacon was crisp which is nice. He said it was a very good tasting sandwich, but it wasn’t something that stuck out to him like anything special, just a normal club. When my chicken and rice dish came it had broccoli in it. I immediately sent it back and asked to see a menu as broccoli was not listed on the ingredients. I double checked the menu and I was right, no broccoli listed. I asked the waiter if he could make it again without the broccoli. He came back and said that they would remake it without a problem. Originally there was no broccoli in it and it was added later on but they never updated the menu. That’s the story I got anyways. For people like me who just don’t like broccoli, or even people who are allergic to it, it kind of ruins the meal a bit. By time I got my dinner again everyone else had already finished eating so I was eating by myself. This made me feel a little uncomfortable and like I had to hurry. My tongue still feels burned for eating the dish when it was too hot. The dish tasted like it was just rice, cubed chicken, and an Alfredo sauce with a little bit of fresh cheese on top. I was expecting more of a risotto type meal and this was not it . It was more of rice swimming in cream sauce with chicken. This is why I’m rating the food so low. I also don’t like any surprises in my food and I consider a main ingredient like broccoli to be a surprise when it shows up and not listed on the menu. The waiter was prompt, brought water right away and was very friendly. He was knowledgeable about the menu and when we couldn’t decide on what we wanted he was very eager to help us. His recommendation on the club sandwich was right on and it hit the spot. He did apologize for the mixup with the chicken and rice dish, but one of the main reasons I’m rating service so low is that there was no manager who came to the table to apologize. I did see someone who I thought was a manager floating around and at one point right after I sent the food back someone did come up to the table, to my husband, and said is everything okay. He was talking to him while he was eating and he said yes and the man walked away. I gave him the benefit of the doubt and assume he didn’t realize I sent food back, but given how slow it was I don’t feel that there was any reason a manager would not of come over to visit me. And in my book that is a huge service failure. I did like the overall atmosphere of the restaurant, and I think if my expectations weren’t so high I would’ve enjoyed it a lot more. And if my food would’ve come out right the first time. This would be a great place to have a party. I do think I will try it again except for this time I will just know the food is going to be good, but not as amazing as the atmosphere. I think if I go in next time with an attitude like that I might be able to rate it higher.